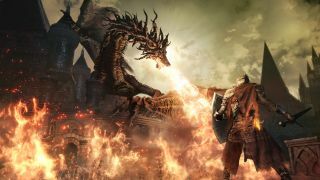 In just two weeks, Dark Souls 3 arrives on western shores bringing with it the series-standard bucket-load of blood and gore and death and cursing at the fact that you got the last boss down to just a sliver of health before she spewed molten lava all over you and you were forced to start again. Hey, deep breath, it happens to us all. I too have "You Died" imprinted deep into my brain as a result of Hidetaka Miyazaki's work. What I don't have is skills like these. While Dark Souls players have achieved wondrous feats in the past, it's no less inspiring to watch new acts of masterful melee within a series so brutally unforgiving. Such as taking down Iudex Gundyr, Dark Souls 3's first boss, with nothing but fisticuffs. Here's that in 60fps. Impressive, don't you think? I can't decide which part I'm most taken with/jealous of there: the player's skills as they duck and dive and dodge Iudex Gundyr's devastating attacks post-transformation; that they manage to last a whole two minutes without taking any damage whatsoever; or the fact that they've somehow got their hands on Hidetaka Miyazaki's latest death 'em up weeks ahead of its western release. I really don't fancy my chances come April 12, but you can check out our review in progress before then.